Column: A perspective on the mandatory student fees and what exactly you’re paying for — or aren’t! Ask any college student, and you’ll soon realize that the cost of college is one of the biggest concerns when pursuing a degree. Tuition is often the culprit, as it seems to be on a never-ending increase, but I think there’s another suspect in the equation- mandatory student fees. Out of my own curiosity and concern, I began investigating and looked solely at the mandatory fees that Georgia State charges. I did not include the mandatory ‘University System of Georgia’ fee that is currently a whopping $404 per semester. Just four years ago this same fee was only $168. This fee is supposedly used to help mitigate costs across the board for the University System of Georgia because apparently the ridiculous ticket price of tuition isn’t enough. So on top of mandatory student fees, you’re also paying $400 per semester to subsidize college costs for universities. This exorbitant price tag is a matter all its own.But let’s shift gears and instead look at the remaining $606 we pay each semester. I’ll assume we are taking two or more classes per semester because the Fall and Spring semester fees max out after just six credit hours (more on that issue later). I want to knock out the easy ones first since there’s plenty of fees I have no qualms with. These are only $40 and $53 each semester, respectively. They provide quality facilities where students can take advantage of a state-of-the-art gym or top notch medical clinic. These are two great services provided by the school at a small cost to students. Library: At just $5 per semester, it’s the least I could pay to support one of there most used facilities on campus. According to a 2012 survey, when asked if “The library’s services and resources help me get better grades in my classes,” 73 percent of respondents selected ‘agree’ or ‘strongly agree.’ This fee has actually gone down from $35 in 2013-14 school year after recent additions and renovations were finished. 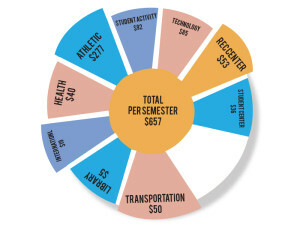 The activity fee helps finance free events such as Pantherpalooza and the Distinguished Speaker series. Additionally, it subsidizes events such as Six Flags Night and the countless other events that Spotlight Programs host each semester. The last two fees, however, are what bother me. Athletics and Transportation fees combined account for almost 54 percent of the mandatory fees you pay each semester. It’s $50 per semester and goes toward helping run the multiple Panther Express shuttles around campus, renting the Turner Field lot for students, and helping subsidize the MARTA monthly Breeze Card, (making it $61 instead of $95). Chances are some don’t take advantage of these services, as evidenced by the packed parking decks each day, so you’re probably paying to subsidize someone else’s discount. But let’s do some math: There’s a little over 18,000 full-time undergraduate students and over 5,000 full-time graduate students. So each year Georgia State receives over $2.2 million for our shuttle service and renting Turner Field. I assume that once Turner Field ceases to exist, and SunTrust Park opens, Georgia State will have a backup plan for free student parking. Otherwise, I expect the transportation fee to drop accordingly because I know it doesn’t cost $2 million to run a small fleet of shuttle buses for eight months. Besides, Georgia State allows anyone to rent a Panther Express shuttle bus for $58.17 per hour, according to their website. Even with what I assume is a high markup on the actual cost of operating one shuttle for an hour, the yearly cost using that hourly rate only comes to just under $2 million per year. However, estimating there’s 10 Panther Express running non-stop for 17 hours per day five days per week. As any student who has waited 20-plus minutes for a bus knows, this is unlikely the case. Ah, the seldom lauded Athletics fee. Coming in at a mammoth $277, I think it would be fair to say that most students at Georgia State wouldn’t mind opting out of paying over $500 per year to financially support our sports programs. However, as that is an unlikely scenario, we can at least ponder why exactly we pay so much for our athletics programs. One aspect of this fee is all of the students currently on an athletic scholarship at Georgia State. This I have no problems with because I understand the hard work and skill it takes to land an athletic scholarship. Further, this fee allows students to attend all of the home games for free. From football to volleyball to our stellar basketball and baseball teams this year, I don’t mind paying to see these games. Only thing, I’ve been to maybe two sporting events in my four years at Georgia State. I’m just not into college sports – but that’s just me. Nothing against the teams, but you and I are still paying this fee regardless. However, my biggest qualm with all of these fees is that when I compare our school to other universities and colleges, I am still left with many questions. For example, The University of Georgia had an athletic fee of $53 last year. Georgia Tech’s mandatory athletic fee for Spring 2015 was $127. Here’s the kicker — if you’re taking less than three credit hours, you can opt out of the athletic fee at Georgia Tech. So why in the world do we pay almost six times more for our athletics programs than UGA? I reached out to three members of the Dean of Admissions via email as well as the director of athletics and did not receive a response time pertaining to mandatory athletic fee questions. The lack of transparency between university officials and the students should be very worrisome and act as a red flag. When there is no way for students to see a line by line breakdown of what exactly their “Athletics fee” is going towards, it creates a disconnect that makes me lose trust in those I entrust with thousands of dollars of my money each year. So you see a recurring theme here; you’re basically paying for a bunch of stuff you don’t use or take advantage. To top it off, the school makes it very difficult to find out how the money is allocated. The thing is, I don’t mind if I’m paying $100 per year to pay for the paint they use to spray the fields, but having the ability to at least know that’s what I’m paying for is all I ask. Until then, a boy can only dream for the college campus and university system of the future. One which uses the basic concepts of a normal market to supply college students what they demand. Until then, we’ll continue to pay egregious amounts of money on a bunch of programs and things we personally might not want. But what if we could find a middle ground for these fees? What if students were able to choose which events they felt they would enjoy and participate in each semester and just pay for those?